I am really trying to get more fish back into our diet. 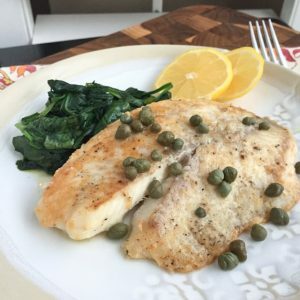 Fish is so versatile, there are so many ways to prepare it whether baked, broiled, grilled or simply pan fried like this Parmesan Crusted Fish with Lemon and Capers – and it’s so good for you! Let’s not forget to mention that not only is it super versatile, but it’s super quick to cook up! Which makes it a dream of a weeknight meal. My friend Deanna has mentioned cooking fish coated in Parmesan a couple of times to me when I’ve asked her the question – what’s for dinner? I love having “what’s for dinner” friends, the ones who you can send a random text to throughout the day to help you figure out what you are going to throw together at the last minute. We all need a few of those friends in our life. 🙂 I tend to get great ideas from those conversations. This fish dish is definitely one of them. I used very little oil when cooking up the fish which kept the very light and low in calories. The Parmesan flavored up the fish really nicely, and gave it a little crust which I loved. I’m a caper fanatic so I loved adding them at the end just so they can warm up a bit with the lemon. 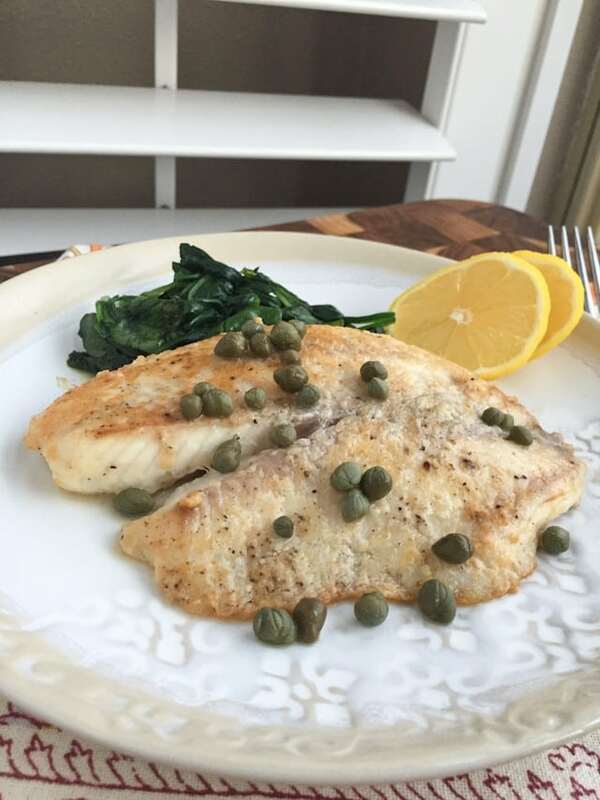 This Parmesan Crusted Fish with Lemon and Capers is a very simple dish, and great for your little ones too (they may question the capers, but try anyway, ha ha). I served it with some cooked spinach and some extra lemon. This one is definitely a feel good dinner! 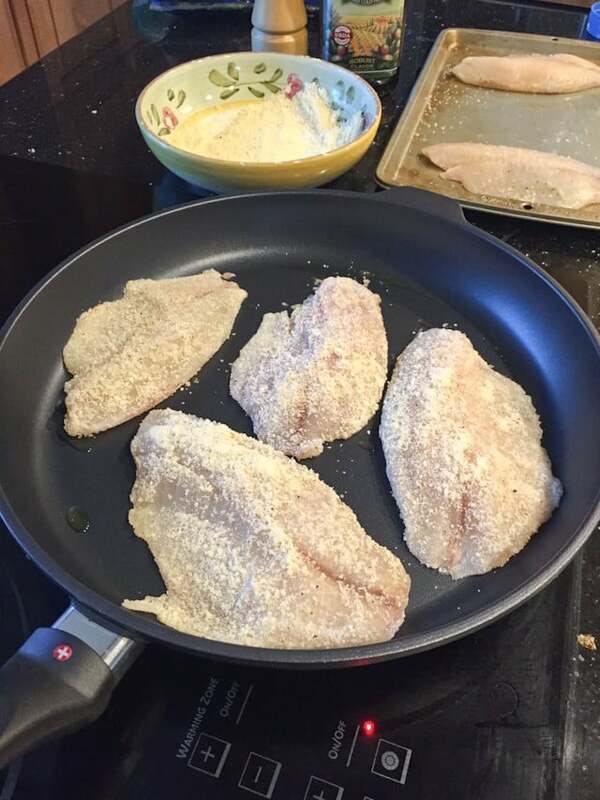 Place your fish filets in a large plate or cookie sheet. Drizzle 1-2 tablespoons of oil and spread over each filet (both sides – I just use my fingers to spread the oil evenly). Season each filet with a little salt and pepper. Put grated Parmesan cheese in a wide bowl or plate (wide enough for fish to lay flat in). Heat 1 tablespoon of oil in a large nonstick pan over medium-high heat. Take your fish filets (1 at a time) and press into grated Parmesan on both sides. Carefully place your fish into your pan. Cook fish for about 4-5 minutes on first side, until golden brown. Flip and continue to cook for another few minutes, until fish is white and translucent, cooked through and easily flakes with a fork. 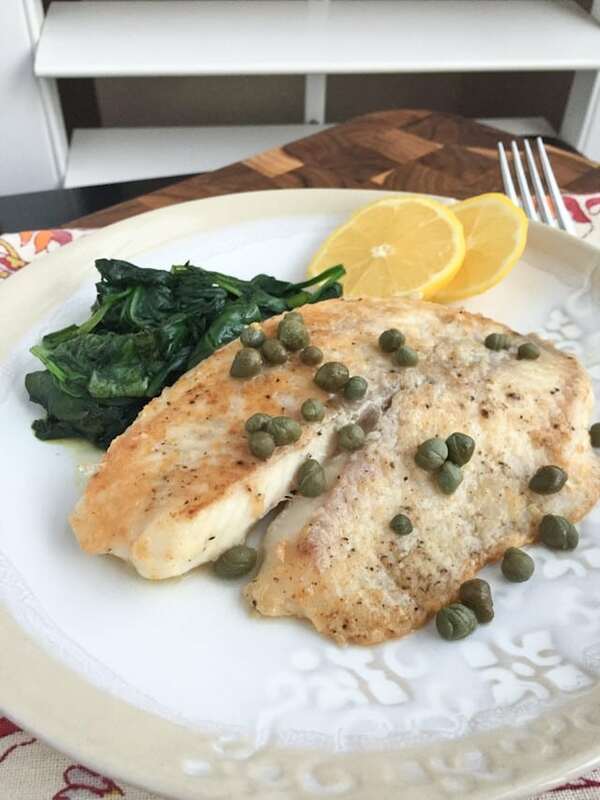 During the last couple of minutes of cooking time, squeeze lemon over fish and add capers to pan. Slide out onto your plate and add more lemon before serving if you desire. Inspired by my friend Deanna. I love easy and delicious recipes like this one! This is right up my alley! Love this recipe, Aggie. So simple. I have some fresh lemons on my counter, too! I can taste it already! I LOVE these flavors, Aggie! A keeper for sure! What’s for dinner friend, love that! Excellent fish recipe! yes, will you be my what’s for dinner friend, Brenda? 😉 Thank you! Wow! This looks refreshing and delicious. I love that so many of your recipes are fresh, fast and simple! A good recipe for living life! Hello – hope you enjoyed it! Sorry I don’t have the nutritional info on hand, I like to use My Fitness Pal to calculate it. There are a few others out there too (Spark People? ).